‘But I have 5 kilos of Chebbakia in my hand luggage, that’s why it’s overweight’ says the man just ahead of me in the check-in queue for the Air Arabia flight to London Gatwick. The member of Fez airport ground crew hesitates then looks up and smiles, ‘Mabrouk laâ washer’ she says and waves him on. That time of year has come round again, and in the medina in Fez, the sweet Ramadan pastry stalls near Rcif are piled higher than high in preparation for the month of fasting. Sweet almond stuffed briouates dipped in honey, or the cylinder shape version with the ends topped with chopped nuts are displayed in their thousands. Vats of ‘Amlou,’ a honey, walnut and pastry paste that is spread on pancakes like a sort of Moroccan Nutella appear but the absolute queen of pastries that will be served in every home that can afford to make or buy them on every evening in this holy month of fasting are Chebbakia. 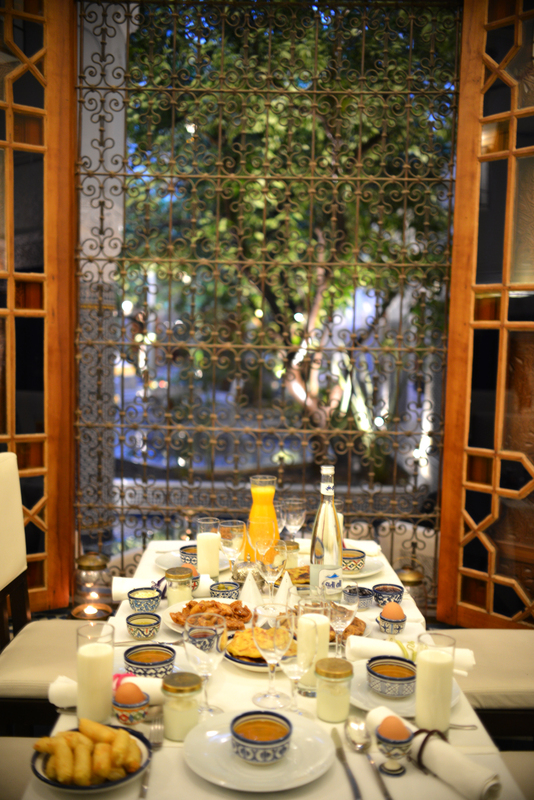 The taste of Chebbakia evokes the essence of breaking the fast during Ramadan in Morocco. The really good ones are made from short crumbly pastry flavoured and coloured by real saffron strands. This pasty is then cut into small squares that are slashed with a crinkled pastry cutter to make a series of evenly spaced gashes. The resulting openings in the pastry are pulled apart and folded over each other a bit like elastic in a game of cats cradle. The end result is a knotted diamond shaped tangle of pastry that is then deep fried, dipped in honey and sprinkled with sesame seeds. One mouthful and you have an instant energy burst, and the combination of this sweet delicacy with a spoonful of harrira, is one of the most delicious things I have ever tasted. So as the new moon appears and the month of fasting starts, Ramadan Mubarak Said to one and all, and easy on the Chebbakia!